Called the Paris of the Middle East, Beirut became a prized tourist destination after the end of World War II. Tourists from Europe and the Middle East targeted Beirut to enjoy its nightlife, social activities, and fashion boutiques. Beirut gradually transformed into the financial capital of the Arab World. The military airfield in Beirut was converted into a civilian airport to cater for the influx of tourists, artists and business people. Passenger numbers rose from a few passengers in 1947 the year the airport was officially inaugurated to a bit less than 3 million in 1975. The golden years faded away as the civil war began in 1975. The country was torn apart and destroyed socially and economically. Passenger numbers dwindled rapidly. Lebanon and Beirut changed from tourist havens to dangerous places to be. After 1992, Beirut rose from its ashes (literally) for a new beginning, and once again, Beirut started regaining its place as the center of the Middle East. The number of passengers arriving to Beirut-Rafic Hariri Airport (BRHI Airport) started to increase again. Expatriates were coming back from all around the world to visit their families, take pleasure in life in their country with parents and friends, enjoy the nice weather, the snow, the sea and the shinny sun during summer and best of all savor the world renowned Lebanese cuisine. Flights to and from Lebanon soared in numbers and destinations to serve a growing economy. Entrepreneurs invested in construction, agriculture and industry, especially agro-food. Trade resumed with the region and to the rest of the world. International industry exhibitions were organized in Beirut. At the academic level, Lebanon had and still maintains an international reputation for high quality education. Gradually, Lebanese public and private universities started receiving again students from the Middle East and the Arab peninsula. The booming economy had an obvious positive impact on air traffic. Numbers increased exponentially. Encouraged by an open air policy, the number of airlines serving Lebanon doubled and the destinations multiplied. The canceling or facilitation of visa requirements for Lebanese to some countries has increased departures to these countries and the number of airlines serving these destinations almost tripled. July 2006, and for a month, Lebanon relived the pains of war and the curve dipped. Fortunately, the war was over in a relatively short time not without leaving its toll on the airport. Runways were bombed, fuel tanks were ablaze for several days. Roads and bridges were destroyed, populations evacuated, the whole country came to a standstill. The proverbial resilience of the Lebanese people had its effect on quickly erasing the damages of war. The day a cease fire agreement was reached, people started coming back to their towns and villages and flying back to the country. Lebanon is always affected by the politics in the region. The Arab spring and the subsequent war in Syria led to the emigration from Syria to Lebanon of around 2 million refugees. The airport served as a departure point for Syrians to the EU and other countries. Presently, BRHI Airport is serving 8.2 million passengers around half of which come from the Gulf countries. Middle East countries hold second place and the bronze medal goes to Europe. Obviously summer and pilgrimage seasons are peak times in the year. 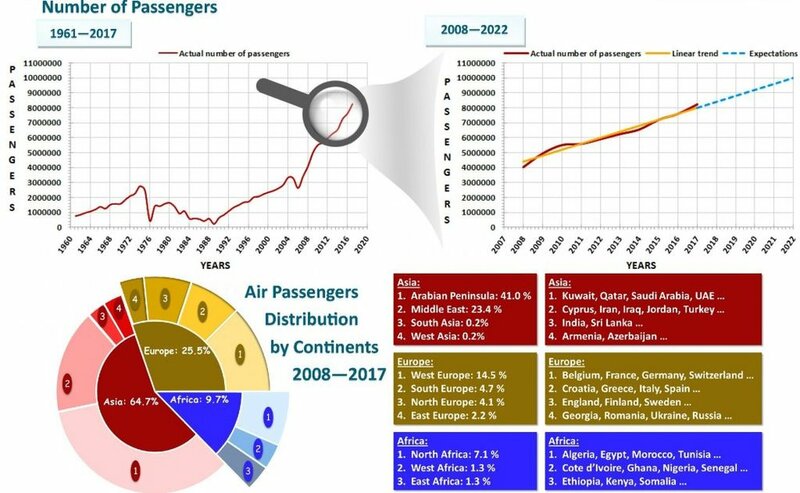 By 2020, it is expected that the number of passengers will reach 10 million. The first airplane landed in Beirut in December 1913 flown by Jules Vedrine from Paris to Beirut in an ambitious venture. Since then, in good and in bad times, BRHI Airport never ceased to serve the needs of the travelers: tourists, business people, students, and expats coming to the country or in transit. The BRHI Airport has remained true to the legend of the Phoenix and despite major setbacks, has continued to rise and expand its operation providing quality services to passengers and freight.